Socialist Alternative member Jesse L holds a sign in Zuccotti Park. When Occupy burst on the scene five years ago, it began a wave of social struggle – including the fight for $15 and resistance to climate destruction, systemic racism, and sexism. Socialist Alternative has been there every step of the way, linking the day-to-day struggles to the need for fundamental system change. We have helped to lead major breakthroughs – particularly, the election of Kshama Sawant as Seattle’s first socialist city councilmember in 100 years. As a result, we have grown dramatically, both in membership and profile. The following only touches on some of the highlights of this work. In September, 2011, Socialist Alternative immediately recognized the importance of Occupy. Wherever our members lived or worked, they got involved in local Occupy activism. In Seattle, Socialist Alternative argued that Occupy should join the struggle against budget cuts to education and social services. When the political elite unleashed the police to break up the camp in Seattle, Socialist Alternative organized “the night of 500 tents,” moving the entire camp to the front lawn of Seattle Central Community College. In Minneapolis, the struggle took on a different character. Occupy Homes focused on the scourge of foreclosures that were sweeping working-class communities, organizing neighborhood “eviction-free zones” and blockades. With the encouragement and involvement of Socialist Alternative, Occupy Homes demonstrated the potential of the Occupy movement to unite broader sections of society around issues that directly affected the lives of working-class people. Everywhere, Socialist Alternative argued for the need to give independent political expression to the fight of the 99%. Most Occupy activists wanted to avoid electoral politics altogether, but in the run-up to Obama’s re-election in 2012, abstaining effectively meant ceding the ground to the corporate-dominated Democratic Party. 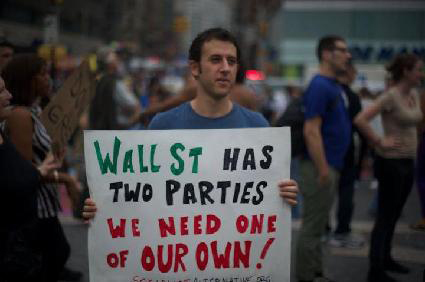 In 2012, Socialist Alternative argued for 200 Occupy candidates independent of the two parties of big business and not taking a dime from corporations. Few existing forces of the left answered the call, but Kshama Sawant of Socialist Alternative ran in Seattle for the Washington State House against House Speaker Frank Chopp, chief architect of devastating budget cuts. Kshama won a remarkable 29% of the vote. The outcome showed the potential for independent working-class politics and exposed the deep reserves of dissatisfaction with the status quo. The next year, three Socialist Alternative members ran for city council positions in Seattle, Minneapolis, and Boston. In Minneapolis, Ty Moore came within 230 votes of winning. But in Seattle, Kshama Sawant became the first socialist elected to Seattle City Council in 100 years. It was a stunning victory against a 16-year corporate Democratic Party incumbent on the basis of calling for a $15 an hour minimum wage, rent control, and taxing the rich to fund transit and social programs. Using the newly won city council seat as a platform, Socialist Alternative and Sawant immediately set up 15 Now, a grassroots campaign to coordinate the fight for $15. Building on the spirit of Occupy, 15 Now created community action groups that empowered and involved people in workplaces, unions, and neighborhoods. In coalition with unions and community groups, Sawant, 15 Now, and Socialist Alternative helped Seattle become the first major city to win a $15 minimum wage. The victory in Seattle gave confidence to working people nationwide and helped spark a movement that spread like a prairie fire across the country. Even when movements ebbed, Socialist Alternative pushed forward. The battle for $15 established emboldened public housing residents to fight back against rent hikes. A 2014 Seattle election campaign helped put rent control back on the agenda, a fight that continues today. This activity laid the basis for Kshama Sawant’s re-election bid in 2015. Unlike Democratic Party campaigns, which rely on corporate money, Sawant ran a grassroots 99% campaign of relentless door-knocking and visibility. Focusing on housing, Sawant’s platform included a call for rent control, the construction of affordable housing for working families through taxing developers and selling municipal bonds, a tenants bill of rights, and municipal broadband. The successful re-election campaign mobilized an army of 600 volunteers and smashed fundraising records by raising nearly $500,000 without taking a dime from business or the super-rich. Bernie Sanders’ campaign continued to push the door open for working people and youth. On a national scale, it showed the massive potential for a politics based on the interests of the 99%. Socialist Alternative formed #Movement4Bernie, staging protests and marches across the country to expose Hillary Clinton as a Wall Street candidate and call for a new party of the 99%. Movement4Bernie and Kshama Sawant initiated a petition calling on Bernie to continue running past the primaries as an independent: It gathered over 100,000 signatures. We now argue that Sanders supporters should continue the political revolution by supporting the strongest independent left candidate, Jill Stein. Socialist Alternative helps to build all fights against injustice and for real gains for working people and the oppressed while pointing, at the same time, to the necessity of ending capitalism, the source of exploitation and oppression. Join Socialist Alternative in fighting for a world that puts human needs and those of the of environment before corporate greed. Join Socialist Alternative in fighting for a socialist future!